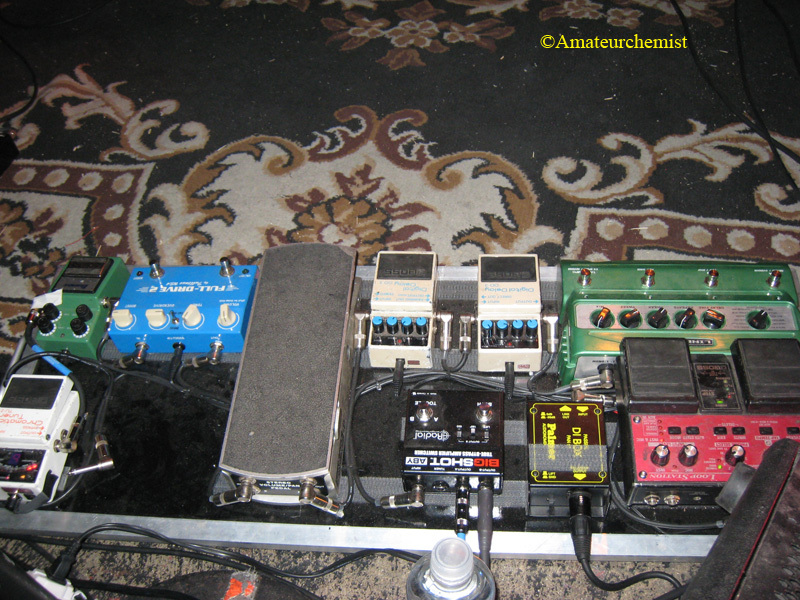 This photo is a shot of Anthony Gonzalez' pedalboard (date and show location is unknown). On the far right side of his pedalboard, the Ibanez TS9DX Turbo Tube Screamer pedal can be seen. 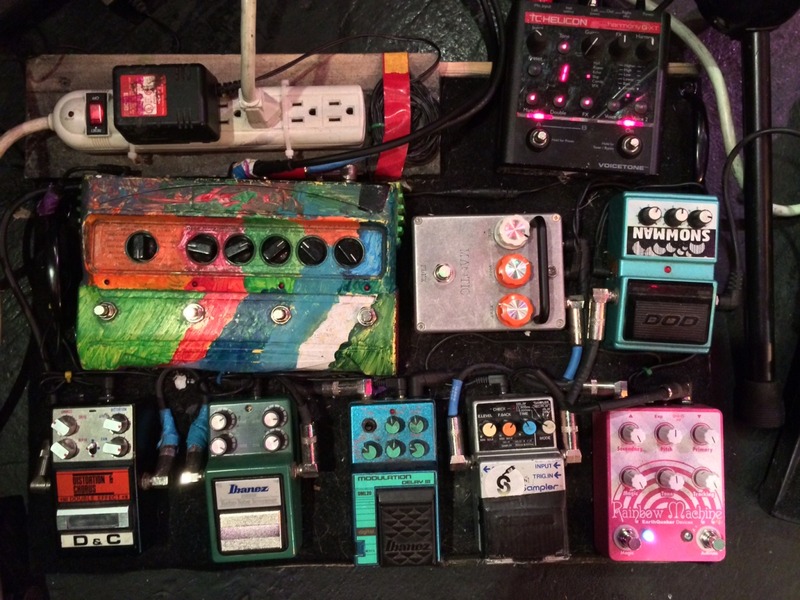 In the bottom right corner of his pedalboard, Brian Aubert's Ibanez TS9DX Turbo Tube Screamer pedal can be seen. 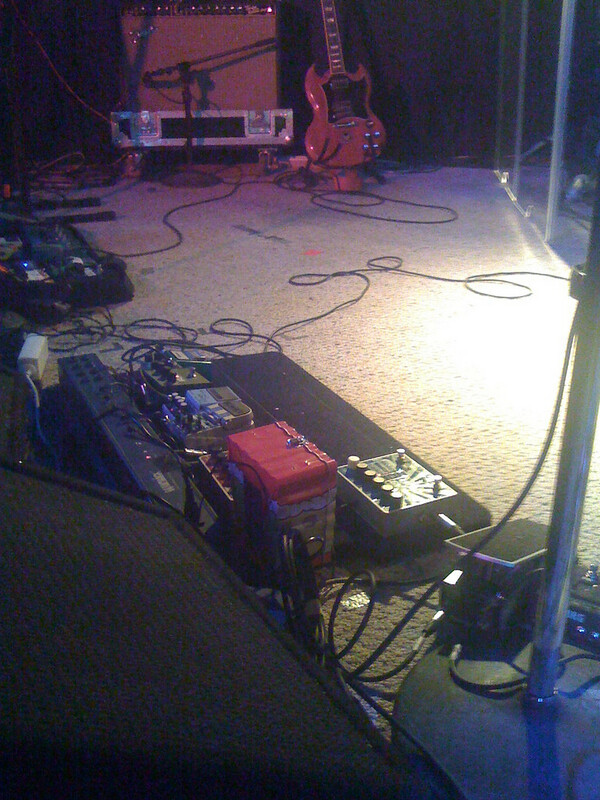 This photo was taken by Amateurchemist at a Silversun Pickups gig at the Silverlake Lounge in 2007. David Hidalgo recalls in this interview: "Pigtronix Aria Disnortion, a Pigtronix Philosopher’s Tone compressor, and an Ibanez Turbo Tube Screamer. I like the Turbo Tube Screamer because it has four gain settings. The Turbo setting adds a lot of low end and makes whatever you’re playing through sound like a 4x10 cabinet. I usually end up leaving one or the other distortion pedals on, and adjusting the volume on the guitar." 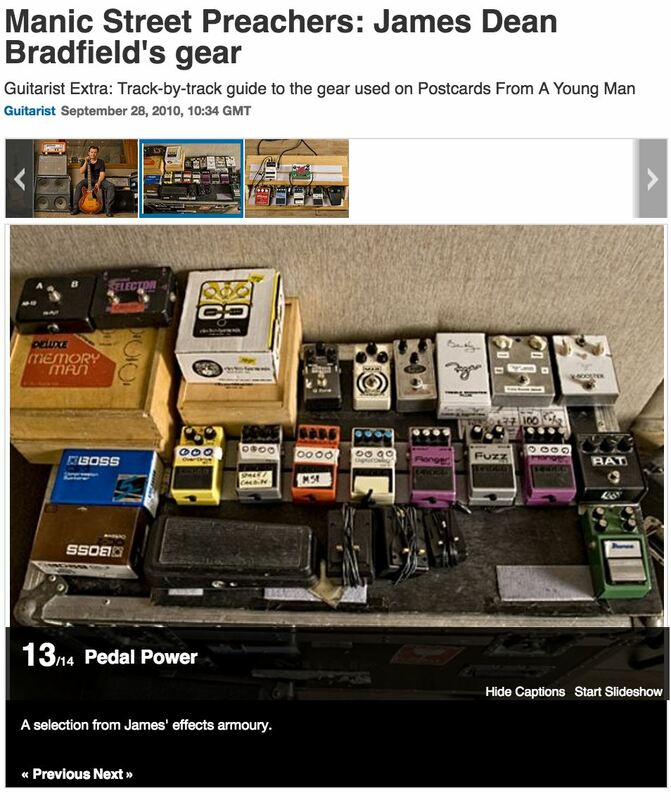 In this photo of James' pedal collection from [this MusicRadar article](http://www.musicradar.com/guitarist/manic-street-preachers-james-dean-bradfields-gear-280353/13), a TS9DX can be seen in the bottom right hand corner. The same article says the pedal was used on the chorus of the track "Auto-Intoxication". "Basically she goes right into a tuner and then it comes back out into this Ibanez Tube Screamer and right into the amp. A lot of really all the Blackheart sound just comes from their hand, they're very plug and play" - Zach Nagy, guitar tech for Joan Jett at 10:00. At 27:22 in the video, you can see the Ibanez TS9DX on Dante's pedalboard. According to Premier Guitar's rig rundown, Roth uses the Ibanez TS9DX Tube Screamer pedal. 1.16 in to the video. he says standard but it looks like the turbo, I think he meant standard as in it's a very common pedal compared to the rest. 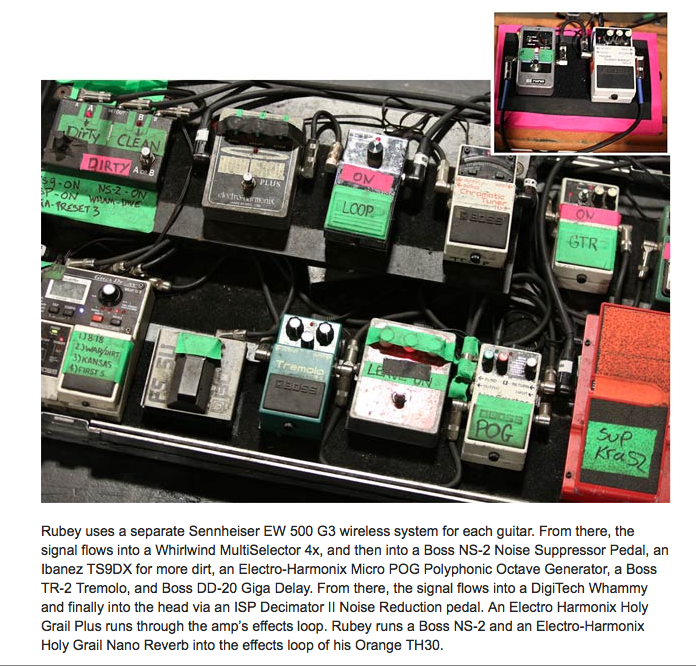 In this [article](http://bluesonline.weebly.com/ruben-block.html) it says that Ruben used the Ibanez TS9DX, wich can be seen on the picture. In a 2013 video, Mark shows a rundown of his gear beginning with his pedalboard. This pedal can be seen at the 0:07 mark. Chris Rubey uses an Ibanez TS9DX "for more dirt," according to [this](http://www.premierguitar.com/articles/20659-rig-rundown-the-devil-wears-prada) Premier Guitar rig rundown. The Turbo Tube Screamer can be seen on the bottom row. At 2.55, Sean shows his TS-9DX. Although he only says "this is my tube screamer", you can see by the 4 knobs that is the TS-9DX. At 2:29 in the video we can see the middle pedal he is using is the Ibanez TS9DX. In the Facebook photo taken by Erin regarding his new Pigtronix Looper, he has a Turbo Tube Screamer at the bottom of the board. From a [Guitar World Article](http://www.guitarworld.com/caspian-s-guide-creating-wall-sound-four-essential-pedalboard-tricks), Jonny's signal chain continues past the Daddy O. to a Turbo Tube Screamer. This pedal can clearly be seen on Declan's pedalboard. It's next to (what seems to be) his Boss BD-2 Blues Driver in the bottom left corner of the board. "I used an [Ibanez] TS9DX [Turbo Tube Screamer], which I keep on the TS9 setting." Picture of pedal board, taken at the the V11, Rotterdam show on the 24th of March 2018. This is just my favorite Tube Screamer over the other ones. I have owned a Ts 808, ts9, and now only this pedal. Tube Screamers are known for a mid punch that rounds out a Fender style amp, or complements a mid heavy Marshall style quite well, pushing it into crunch heaven. My rig is a Fender HRD, clean and loud, and pedals in front for dirt. First usually an EP boost, but not needed with this pedal. There are four settings to adjust, one is straight ts9 sound, weak and thin- but in position two on the dial- BAM! Bass boost heaven!. Fat as anything on the board. Fantastic for Fender or Clean amps, and single coils. Ridiculously bass boosty. Don't have it anymore: Think that the turbo function just add a bass to the sound, and the same settings side by side with ts-9 sound a bit diferent. Sure it is a good pedal, but to my ears, ts-9 is different and it is better. Overall, this pedal is great and no one would regret it. Its cheap enough for the wanna be's and has enough quality for the pros. It sounds good and reacts well. Overall, i would reccomend this to anyone. I rate this pedal a 9 because everything on this pedal is great.The different modes are distinct and give different sounds and the controls are great. It's a tube screamer with a few more settings that blow out the low end and can get a nice fuzzy sound when stacked with another dirt pedal. I find it works best as a boost to a dirty tone, I'm not fond of the way it affects my clean signal. The various modes really don't add much gain so much as they fuzz out the low end I think. I use the TS9DX to break up my tone and give my signal extra warmth. this is the 1st pedal i bought it was an awesome pedal the first time i plugged it,it was a awesome time i played all my favorite songs and it sound exactly i want to listen to i was supposed to buy this in 2017 in france but they dont even have it there but i let a relative of mine buy it for me but i thought she'll send it to me via mail but she gave it to me when i went on vacation cause she supprise us by joining on that vacation. Very versatile overdrive. I'm actually using this as an low gain overdrive and it makes the guitar sound more alive, i never play an 100% clean sound, so, this pedal is very important for my set. It goes to 11. Classic distortion. Nearly always switched on for me.